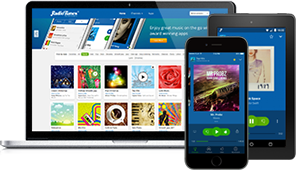 RadioTunes Premium subscribers enjoy audio quality that is twice as good as the free options. Compare the sound quality of our Free (40k AAC-HE) and Premium (128k AAC) streams to hear the difference for yourself. RadioTunes is now part of our newtork along with the following Internet Radio services - so your Premium Membership will work on their channels too! I like several of the RadioTunes channels but my favorite is the movie soundtrack channel. You have a much better soundtrack music selection on RadioTunes, and the audio quality is great! I like the huge variety of channels that RadioTunes provides so I can find something appropriate for whatever mood I’m in. You have loud electronic music to keep out the noise so I can concentrate in the office, or classical or jazz when I want something quieter at home. I can pick any channel, depending on mood, and you will always play a song that picks me up. Premium is worth every penny. I love listening commercial-free to hand-selected tracks on your Best of the 80s channel instead of hitting randomize on a disc and hearing the same song repeated over and over. Keep up the great work. I've been a RT Premium member since July of last year. Love the variety of music channels and a nice quality sound, commercial free! An unmatched selection of easy listening channels that get me through my busy weekdays! Even better without commercials! RadioTunes has a great range of genres. Perfectly curated music in each channel, and really the best tracks in every stream. Premium offers good sound quality, too. I never get bored with the number of channels and genres of music on offer, and I have discovered artists that I would not have heard on mainstream radio. Great service, keep up the good work!